Tea is a hot topic for all Janeites, and I’d be a liar for saying I don’t conform to the earl grey-loving, tea leaf snipping stereotype in some way (even if my daily drink is coffee). I also spend a sickening amount of time looking at beautiful vintage tea cups on Etsy and lusting over them. Kim Wilson’s Tea with Jane Austen ISBN: 978-0-7112-3189-4 has sat on my shelf for some time. The short 115-page hardback was given to me by a close friend who moved away, and she wrote in it that while some things change considerably, other things remain the same forever. With its willow-pattern-esque china teacup dust jacket cover (and the pattern was actually popular in the 1700s and 1800s), it’s a gorgeous slim volume from 2004 that I think most Austen-lovers should attempt to acquire. Tea, and the art of taking it, is something of a social event. Whether it’s high tea, or someone offering it to you after a particularly hard or long day (it’s my mother’s cure-all drink, and it really works), it’s not just about consuming a drink. This is hugely important to remember when you set about reading this book. Luckily, Wilson understands this, and her book is no shallow look at the different teas consumed (although this is discussed too in a particularly gorgeous chapter about making the perfect cup of tea), but a deeper analysis of the role tea played in Jane Austen’s life, and the period of the time. I love that she shows us how it actually affects parts of the different novels, and Pride and Prejudice, that we manage to gloss over in our minds – perhaps considering them small unimportant details, or just not truly gleaning their importance to the overall plot. This is something I’ve been pondering for a while – as I increasingly learn about the Regency era generally (and I read about it a lot), I find myself noticing different details when I re-read the novels and gaining an increasing amount of respect for, firstly, Jane Austen’s ability as a writer and then for the actual stories themselves. While there has been some minor criticism that the book focuses more around tea than it does Jane Austen and her novels, I rather think that this leaves a good opportunity for readers to apply what they have now learnt about social rituals to the novels as they delve back in. Jane Austen’s material is always some of my favourite for reading over-and-over. From what her novels tell her, to general tidbits from the time, to real recordings of Jane Austen in her letters about different tea ladles and “six whole teaspoons, which makes our sideboard border on the magnificent,” it’s a really interesting look at how the right table placements can reflect rank, and the wrong ones can reflect want of style. Just like behaviours at a ball or in public – Regency tea is just as much about what is unsaid and what is missing, than what is actually there. This really shapes my thoughts on Pride and Prejudice. When Elizabeth is first at Pemberley, it’s clear she’s taken aback by its grandness and the size. But imagine the smaller details that would hit this home even more. “At the grander houses, such as Mr Darcy’s Pemberley in Pride and Prejudice, boiling water for tea in a simple copper kettle on the hearth would have been unthinkable,” writes Wilson discussing breakfast affairs. In fact, “large, often lavishly decorated silver tea urns were used.” Every aspect of life is shaped in such a way that your class, and your breeding, are unavoidable. Even the timing of the time you had tea accounted for your degree of fashionablity! For instance, Lydia and the Gardiners are said to have breakfasted at ten before her wedding – however, the more fashionable did so at close to 11 or midday. This is, mentions Wilson, seen again for Lizzy – after she takes breakfast, she receives words of Jane’s sickness at Netherfield. She walks the entire way there, and bursts in on the Bingleys and Darcy eating breakfast. While to most of us, this is not of concern (there’s hardly a set breakfast these days, and many of us skip the damned meal) it clear says something for readers of that time. The pressure of appearances is so much more intense than a modern day reader would probably account for, so I have renewed respect for Lizzy for holding her own at Netherfield and Pemberley, and for not feeling outranked with all of the finery around her. Wilson also weaves into the information aspects where tea isn’t mentioned in Pride and Prejudice, but where it could have featured – giving us a more complete picture of what we’re reading. “Couples flirted and took tea in covered arbours or lost themselves in shadowy ‘dark walks’, perfect settings for the dishonorable intentions of such rakes as Pride and Prejudice’s George Wickham’. And, to top all this off, there are fabulous recipes dotted throughout. Readers of The Bennet Sisters will know I have a bit of a compulsion to cook Regency food (and to veganise the butter-heavy meals), so I took this challenge on. 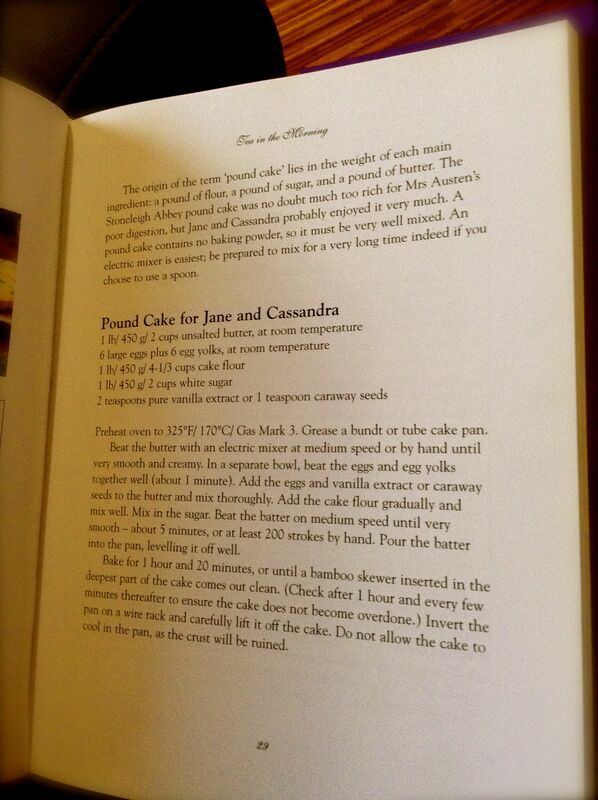 I decided to cook the ‘Pound Cake for Jane and Cassandra’, as not all the recipes have pictures and I like to make sure mine comes out at least somewhat close. 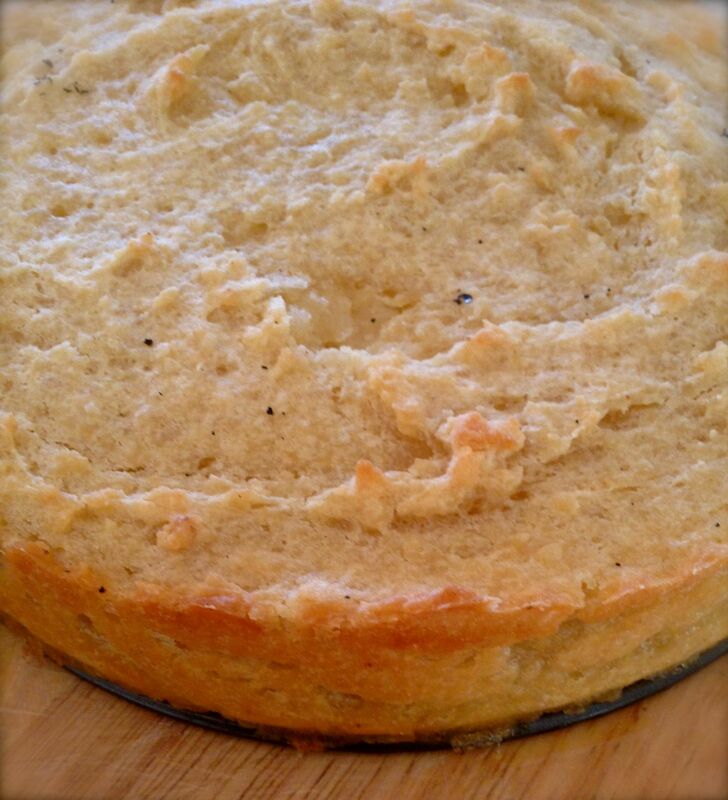 It asks for two cups of unsalted butter, six eggs, 450 grams of flour, white sugar, two teaspoons of vanilla extract or one teaspoon of caraway seeds, based on the 1807 recipe. I instead used two cups of Nuttelex butter (my favourite vegan butter replacement), six eggs-worth of egg replacer (and a tablespoon of vegan custard powder to give the right yellow colour), 450 grams of Has No Gluten Free self-raising flour, raw brown sugar (about one cup) and one teaspoon of vanilla essence (it’s pretty strong). Basically, mix everything up together and bake – it’s straightforward. 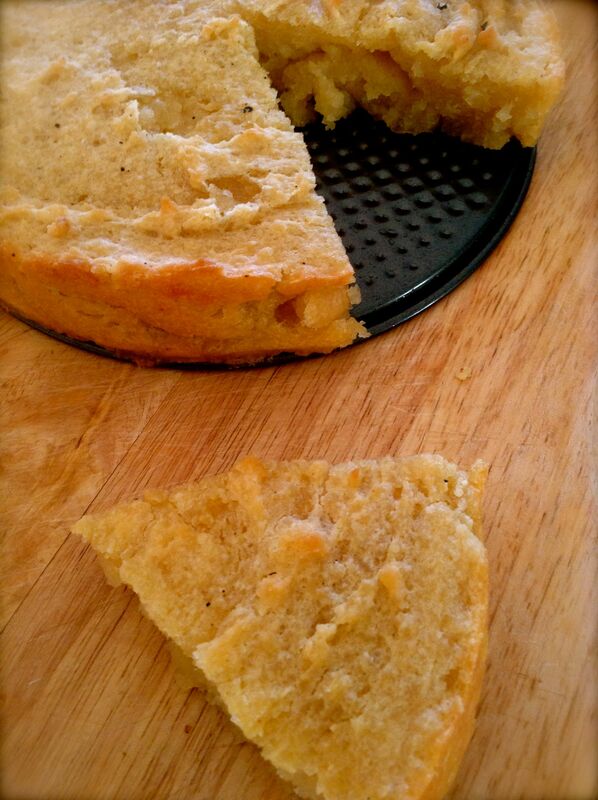 It worked out into a beautiful buttery moist cake (with a fairly crisp exterior), somewhat close to the desired picture above, that we all had with a cup of tea – I had it with Lapsang Souchong, which is a beautiful smoked tea that goes well with sweet things. Here’s how it turned out. It lasted a couple of days before getting a bit too dry (last two small slices) and the puppies ate it up. I then went and got some caraway seeds to experiment with – they’re in the herbs and spices section at the supermarket and not too expensive. It tastes like aniseed, which I love, but that my household isn’t hugely keen on licorice-style flavours it was probably a good one to avoid. There’s also plum cake, modern bath cake, icecream, jelly, gruel, syllabub, cheesecake and more recipes to try out. I can’t express my excitement enough! 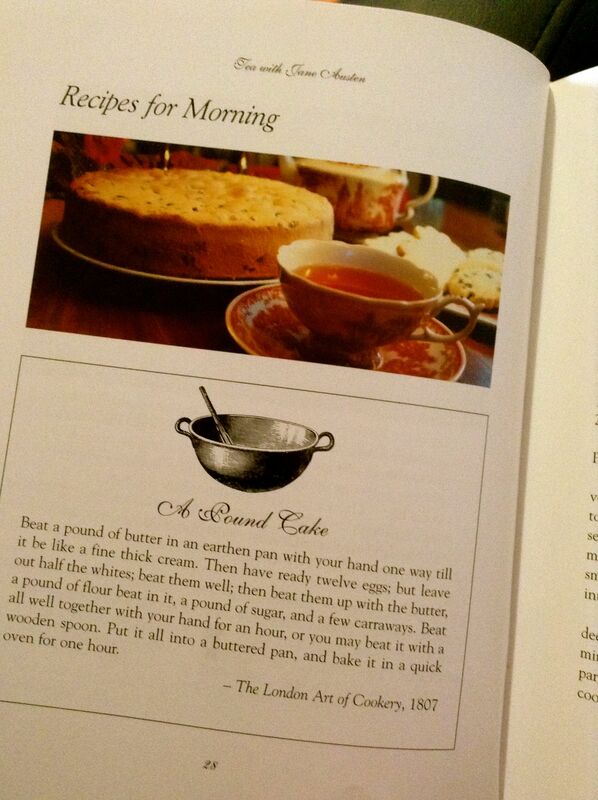 The recipes are modernised versions of traditional recipes – written into plain English by Wilson. The chapter about making the perfect cup of tea, or “A good dish of tea” focuses on the ingredients used and the preparation of the water. Boiling the water multiple times is, essentially, bad (so keep that kettle empty), as is using “inferior” tea laves. Loose tea is preferred to teabags, but if you’re running short on time, then I’m sure you’ll be fine to dunk in the bag instead (in particular, T2’s teabags are outstanding, I think the silky bag texture and pyramid shape allows the tea leaves to float more freely than they do otherwise). You might also want to buy the Twinings brand, which Jane Austen actually bought herself. Apparently, it’s about one teaspoon of tea leaves per cup of water. Also, it notes to ensure you’ve stored your tea in an airtight container. Some of us never had time for teapots, myself included, but it notes that you should rinse it with hot water to ensure it’s warm before adding in the tea leaves and water, as it helps steep the leaves. It’s also all about the boiling temperatures. Wilson delves into the correct temperatures for Oolong, herbal and black teas, against white and green teas (and light oolong). This is no surprise to me – my tea-loving Mum had a great kettle that you clicked the type of tea or temperature and it would boil it to the perfect degree. For us with mere mortal kettles, guesstimating or a thermometer will have to do. Then again, the perfect cup of tea when it comes to using soy milk or other nut milk is an art all of its own to ensure it doesn’t curdle, to choose the best type of “milk” for the drink and so on. I generally steer clear of fruit teas and herbal teas, unless chamomile or mint, but most tea flavours I’m keen on – I’ve even seen earl grey-flavoured vegan cupcakes offered before. And don’t forget your “after-tea” entertainment – in Pride and Prejudice, for instance, after Mr Collins has tea with the Bennets, Mr Bennet asks him to read aloud (whereby the dreaded Fordyce’s Sermons is prompted), while after tea at Rosings, the card games are brought out. This book is gorgeous – little pictures and quotes, poems, and beautifully segmented out that you can either read it the whole way through chronologically, as I did, or dive in whenever you have a spare moment or a tea break and open up wherever you choose. From “Tea for Oppressed Heroines” and “A Splendid Supper” to “The Scene of Dissipation and Vice” to “Tea on Horseback”, it spans her novels, and her time, beautifully. I really can’t recommend it enough. Wilson, who hails from Wisconsin, has also published a book entitled In The Garden with Jane Austen, in 2011, which I think would be similarly interesting – and now sits atop my wishlist. Clearly she is as much a fan of looking at the more minute aspects of Regency life as I am. I’ll leave this review on a quote from the foreword by Tom Carpenter (a Trustee at Jane Austen’s House in Chawton) that is perfectly apt in describing the importance of learning these “background” details to understanding the novel as a whole. “Whilst to us tea is an everyday commodity in our larder with a wide variety to choose from on the shop shelf, and added without much thought to the shopping list when re-supply is needed, it was regarded as something rather more special in Jane Austen’s time,” writes Carpenter. The book seems to be available pretty widely for $20 to $30. If you want another veganised Regency recipe, check out my review of Kim Izzo’s Dinner with Mr Darcy. I loved the book, too, Jennie. Thanks for this review. I enjoyed reading about your experiment with the pound cake. One of my favourite recipes from the book is for syllabub, which I often make at Christmas. I’m going to have to try the syllabub! I should make more – have quite the collection of Austen cookbooks now and love veganising them :). I made negus before, which was great! Negus — now there’s something I haven’t tried. Did you like it enough to make it more than once? I made some little cakes (can’t remember the exact name) from The Jane Austen Cookbook, but I only did it once because I found the mace overpowering. Syllabub, on the other hand, I could eat any time. I wonder what the vegan version would be like. How do you substitute for whipping cream? Negus is lovely – basically a slightly more citrus mulled wine, so nice. There’s rice-whip, which can sort of do a whipped cream aspect (they even do a vegan cream in a spray can too now! ), so it might not have the same consistency but I hope would work! I saw some made on that tv show recently – the one about staging a Regency ball (I think?) and it looked amazing! Yes – not a fan of mace either!